Ever since Deepika Padukone wore Chandbali earrings in Ramleela, this beautiful, distinctive and timeless Mughal jewellery style has gained major popularity. The word “Chand” alludes to the moon and “Bali” means earrings, therefore, chandbali earrings resemble crescent moon set within each other. Chandbali design was originated during Nizam or Mughal era in Hyderabad. ZeroKaata, your best online jewellery store presents a wide range of chandbali earrings from our exquisite and jaw-dropping collection of handmade jewellery. Buy Chandbali earrings online from ZeroKaata’s exquisite collection of handmade chandbali jewellery and look beautiful in our reasonably priced chandbali earrings. From vibrant multicolored chandbalis to subtle hues with a combination of exotic colors, we have a wide range of chandbali earrings online, available in a plethora of designs, shapes and material. Our entire collection of chandbali earrings has been handmade with love and utmost precision and features beautiful intricate work and embellishments crafted with fine detailing. Be it a saree, lehenga, an anarkali, an ethnic gown, ZeroKaata’s beautiful chandbali earrings are perfect to be paired with almost any Indo-western outfit and traditional attire. Our entire range of online chandbali earrings comes at the best prices and is very comfortable to carry. Buy now, pair it with a variety of outfits and adorn an awe-gasping look almost effortlessly. We have an easy no question asked 7 days return and exchange policy and free shipping. Place your order with us and get your favorite jewellery from the comfort of your home. We ship to more than 20,000 pin codes PAN India. We also provide International shipping, secure National and International payment gateways. Chanbali is a worthwhile style to have in your jewellery trousseau. Take your pick and add drool-worthy designer chandbali earrings to your collection. Flatter your stunning persona with ZeroKaata’s beautiful Chandbali earrings. 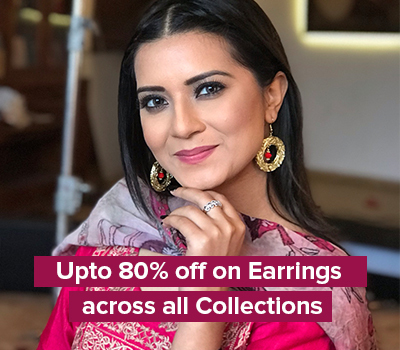 Buy Chandbali earrings from our amazing handmade jewellery collection of skin-friendly handmade jewellery and add a statement appeal to your look. Sign up to get 15% off on your first order. For any product related query, write to us at info@zerokaata.com or contact ZeroKaata Customer Care at +91-8920578655.